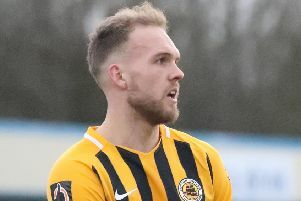 Craig Elliott says it was ‘out of order’ for his Boston United side to be labelled bottlers. The Pilgrims boss said he was proud of his squad for coming within a whisker of beating the promotion-chasing Bucks at the Jakemans Stadium today, after hearing cat calls from members of the home support. “I was disappointed with the crowd. I was thinking there was a lot of negativity towards the players,” Elliott said after Theo Streete’s 95th-minute equaliser. “I said to lads, they’ve got to get themselves going, and I was proud of the lads second half. They showed a lot of courage and heart. “They (Telford) are a fantastic team, in the semi-finals of the FA Trophy, doing great in this league. “I don’t think you should respond to the crowd, and they’re fantastic, I love them to bits. But to be called bottlers, I think it’s out of order. “These lads have put great shifts in and tried their hardest. Don’t disrespect Telford, they’re a good team. Daniel Udoh gave Telford a 10th-minute lead, but second half goals from Ben Davies and Gavin Allott put Boston in front until Streete’s leveller at the death. “I think we did everything I asked second half, the gameplan,” Elliott continued. “We made a bad error for the first goal but we wanted to be in the game and competitive at 50-60 minutes, and I think we were all those things. “They had chances, we did. I felt in the last 30 minutes we were the better team and deserved it. “The only difference I see in the two teams is one’s got confidence and is on a good run. And one team is waiting for something to happen.